Over the last few decades, mobile communications have significantly contributed to the economic and social development of both developed and developing countries. Today, mobile communications form an indispensable part of the daily lives of billions of people in the world, and are expected to continue to become even more widespread in the future. In ...that future, however, it is foreseen that the growing demand for higher volumes of traffic, more connected devices with diverse service requirements, and better and uniform quality of user experience will bring a need for evolved systems with extended capabilities. 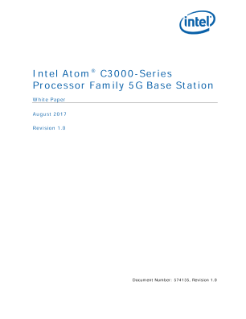 Deliver low-cost, high-density, web-tier workloads on the Intel Atom® processor C2000 product family.